IEstatesAgent - Take control of your real estate! Pulse was contracted to rebrand and update an online estate agency website when the existing business relaunched with new owners and a new name. Pulse gave the site a modern feel, replacing old images with clear icons and improving the process flow for visitors and adding a payment gateway. The challenge was to present all the different service options without confusing the user, this was done using high contrast graphics and icons that brighten the site and make it easy to use at the same time. 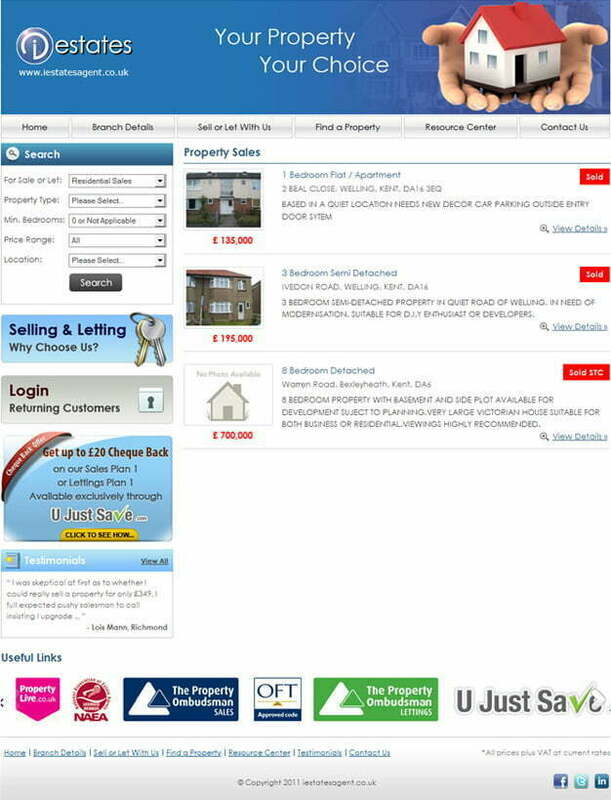 The website enables property owners to sell or let property themselves. Pulse developed feeds to major property portals which enable these owners to give their property the maximum exposure by listing them on these portals. Property owners can access a range of supporting services from the site and are given guidance and advice on marketing their property. Clear information is given about the properties and action buttons encourage visitors to take the next step in making an enquiry. Technologies used were PHP, MySQL, Integration with XML web services, Flash and AJAX. Contact us for your Real estate web design needs.